Let me just star by saying, if you think Poison Princess ended in a cliffhanger, you haven’t seen anything yet. On the other hand, I have come to the realization that an author can’t make me suffer through a cliffhanger unless she/he have drawn me into her world to the point that it hurts when I get abruptly taken away from it, and to me, that’s a sign of a good storyteller, plus, I’m a true believer that there’s no pleasure without experiencing a little bit of pain; to say that I’m eagerly expecting the next novel would be a total understatement. There’s so much more to say about this story besides the way in which it ends, for starters, although Evie has fully (for what we know now) come into her powers and seems to be a much stronger girl than before, things are not looking too good for her and her friends. The dangers have escalated, and when she and her crew get kidnapped by a group of sick minded cannibals that make the flesh eating zombies look like just a pest, things get really scary, and let’s just say, Ms. Cole will have your complete attention. In a world where nothing is ever what it seems you will not only find the heroine navigating it with care, but you will also find yourself questioning your feelings direction and eventually, for whom to root. In this installment, we get a closer look at the Knight, Death, and so does Evie (a very close look), but all the while it will seem that just as Evie, we won’t be able to keep Jack from our thoughts, and the romance will take just as the story does, another unexpected twist…or doesn’t? The action, although not as intense IMO as in Poisson Princess gets wrapped with a layer a mystery and intrigued, be-careful of who you trust. I love when an author creates a world the opens up my mind and lets me theorize the possibilities of its outcome. 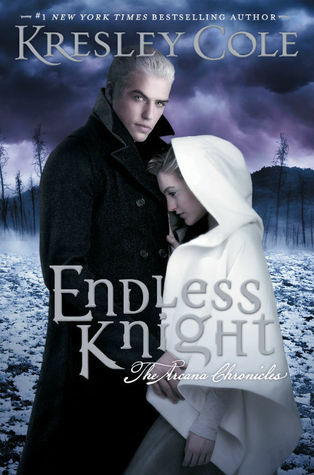 Endless Knight is a brilliant entry to this YA paranormal tale, and don’t let the YA tag scare you away; I will put a big emphasis in the Adult part for this entry. If you are mostly and adult material reader or listener I highly recommend this series, if you don’t know Kresley Cole, this is a fantastic series to get acquainted with her talent; however, I must insist starting with book # 1. I’m a huge fan of Emma Galvin! When I find out that she’s going to be reading a book from my TBR I literarily do cartwheels. As usual she’s fantastic at transporting you to the word, and communicating the tone of the story. She most definitely makes you feel the angst, danger and urgency of the novel. What I love the most about her readings is how easily she puts you in the heroine’s mind and how authentic her voice is for depicting a YA character. I never had a problem finding the difference via her tone or voice for each character, yet I have to admit, I had a little of a hard time at the very beginning of the book distinguishing who was talking. This is very unusual in my experiences with her work, at the same time, I have to add, within a few chapters I didn’t have that problem anymore, and I just got completely lost in the story. I feel I have to mention it, just in case you experience the same, and to let you know, it does gets better. I was a little disappointed when I found out that Keith Nobbs wasn’t going to be co-narrating this entry; however Emma Galvin does a really good job carrying the story on her own. All in all, this is a fabulous entry, well executed, I highly recommend the Endless Knight audiobook, to YA and adults alike. First off, thank you for not giving spoilers. You’re review made me excited, this is on my TBR for this week and I was initially planning on reading this end of week. On second thought, I’ll start reading this today. I loved book 1 and the entire concept of the book, the world building is phenom & Death! That boy/man/creature is under my skin! Thanks!I try very hard not to give much away, sometimes I feel I say too little, but my purpose is to inform peeps about the narration. I know you are going to love it! The story, the twist and turns, plus the mind teasing make this a fabulous read. Ooo you tempt me, I have not read the first book, but you seriously make me want too! I have a love/hate relationship with cliffhangers. I love that OMG feeling but I hate the wait! Oh! Haven’t read it yet? I definitely recommend the audio, if you starting to indulge in the pleasure of listening, this is a must. I really think you will enjoy it, the narrators do a terrific job bringing this story is ts character to life. Ohhh this is the sequel to Poison Princess? I haven’t read it YET, but I didn’t even realize this was a sequel when I 1st saw it popping up. I really don’t mind cliffhangers as long as I enjoyed the book. I don’t mind cliffhangers either, they just make me have something to really look forward too, but like you, I only suffer when I loved the book. You got to check Poison Princess, is a fabulous read/listen.